It has been nearly a year since any new episodes of Doctor Who (recent buzz puts the premiere for season 7 as near as September 1st, 2012! Someone hold me!). This has caused many of us Whovians to either re-watch the past season over and over again or find ourselves as far back as watching older Doctor Who in hopes of appeasing the Time/Space demons that live on our backs. And where Community has tried to lighten our waiting time with their own cheeky tribute to our Doctor here and there, we simply have a need that runs much, much deeper. Well, gentle reader, we do have such a thing. In a way, of sorts. 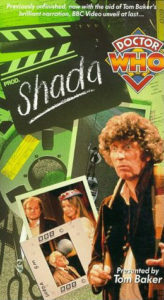 We have “Shada,” or rather as it is known by booksellers, Doctor Who: Shada: The Lost Adventure by Douglas Adams. “Hold up, wait a minute, don’t go there ’cause I ain’t wit it,” you might find yourself saying. Especially if you are fan of the hip-hop/rap group 24K, whose one hit wonder is on the soundtrack to Dangerous Minds. Yes, this isn’t exactly a new Doctor Who tale. It’s not even really “lost,” as it claims to be. In fact, it is a rather old tale that has its own tale to tell before I tell the tale of the tale that tells the tale. That got away from me before it even started, but I made it through and we’re here. So, history! 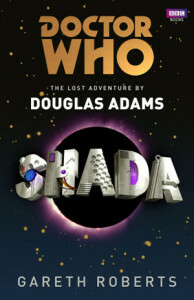 “Shada” was intended to follow “The Horns of Nimron” as the final serial of season 17 of Doctor Who, penned by Douglas Adams. Most of it was even filmed, but never completed due to strikes at the BBC during 1979-1980, which, because of the strikes, makes it a lost episode in the fact that it was never completed as intended. This would also wind up becoming the third and last contribution Douglas Adams made to Doctor Who as he would leave to do The Hitchhiker’s Guide to the Galaxy. It’s a minor loss for us Whovians, but a bigger win for us geeks as a whole. If parts of this episode were shot, what happened to it? Well, they did try to get the last bits filmed, but Christmas specials for other shows took much of the studio time and “Shada” just could not get finished in a timely manner. But no fear, depending on how you like your canon, you have four choices on this multiple answer choose-your-own-adventure. First, you could get this (at the time) Holy Grail of Doctor Who episodes by way of a fan group from New Zealand which published an unofficial collection of a 6-part adaptation of the script in 1989. You see, Adams had never given permission for the script to be published as a book, only in segmented adaptations to a magazine. Or, you can just read the scripts, provided you can get your hands on a copy. Douglas Adams would also take characters-in particular one Professor Chronotis and his time machine-and plot pieces from “Shada” for use in Dirk Gently’s Holistic Detective Agency. So, if you squint your eyes and use a bit of imagination, Dirk Gently almost becomes a Doctor Who story, much in the way the third installment of Hitchhiker’s can. Well, in 1992 the BBC released a VHS (remember those?) of the shot footage using linking narration of Tom Baker’s Fourth Doctor to fill in the unfilmed segments. I should have made mention that Tom Baker was the Fourth Doctor during season 17 and that he stars in said episode. This was enough for most Whovians. For others, not so. Big Finish Productions would put out an audio play adaptation of the story using Paul McGann’s Eighth Doctor as the lead in 2003. This was later given Flash animation treatment for the Internet. As much as I love McGann and his Doctor portrayed via comic or radio play, this is simply best as a Fourth Doctor tale and not an Eighth. And whether or not we’ll ever see Ian Levine’s fully animated version from 2010 featuring the Fourth Doctor is yet to be seen, due to legal issues with the BBC. With those options seemingly laying wanting and exhausted, we now have what seems to be the proper definitive end all, and seemingly canon, answer. Though it boasts as being written by Douglas Adams, it is actually co-written by Doctor Who and Sarah Jane Adventures scribe Gareth Roberts. Gareth’s street cred includes writing for Doctor Who Magazine and writing at least two novels for the new series of Doctor Who (Only Human and I Am a Dalek). He has also written Who pieces for the BBC’s online site, including some of the TARDISODEs. He has written four full episodes for the new series of Doctor Who, “The Shakespeare Code” in 2007, “The Unicorn and the Wasp” in 2008, “The Lodger” in 2010, “Closing Time” in 2011 and the second of the 2009 specials of Doctor Who, “Planet of the Dead”. So, needless to say, he knows his Doctor Who and it shows. Working from the most recent scripts and shot footage, Roberts weaves the tale in a very convincing Douglas Adams-esque voice.